2018 Yamaha XSR900 - Compact, 847cc, DOHC, 12-valve (4/cyl), liquid-cooled, 42.5 degree inclined, inline-three cylinder engine. 2018 Yamaha XSR900 CONQUER ROAD Based on the popular FZ-09, the XSR900 is a beautiful blend of 3-cylinder performance and eye catching "authentic sports" styling. 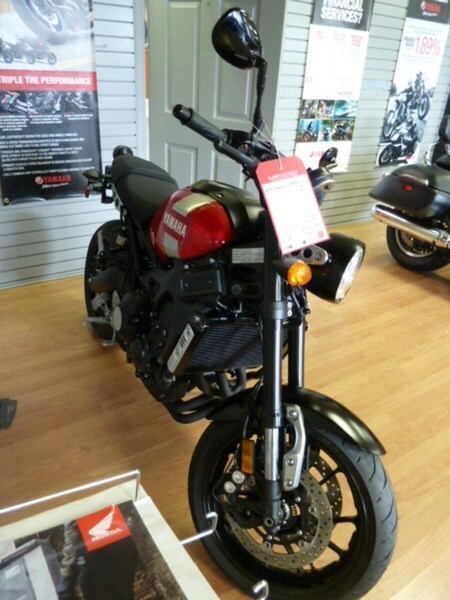 The XSR includes all of the FZ-09's key features plus traction control and ABS equipped brakes. A natural riding position offers solid riding comfort while the slipper clutch with assist highlights the more serious sports side of the XSR. 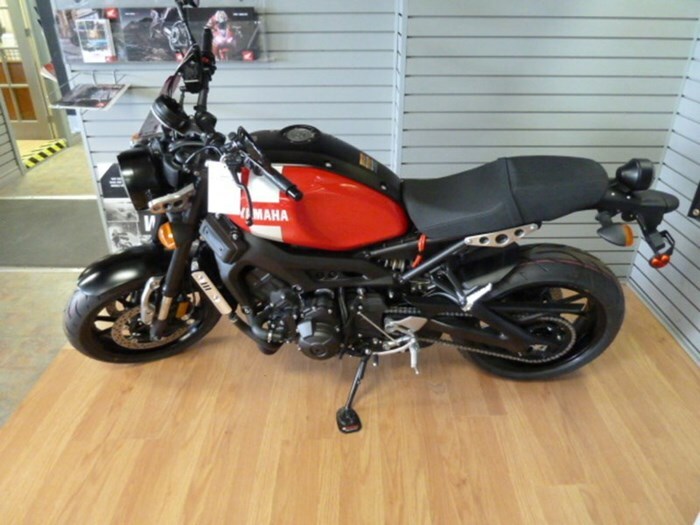 Tasty, timeless styling combined with plenty of Yamaha's latest technologies, the XSR is guaranteed to provide a fun, exciting ride. POWER Liquid-cooled, 850cc in-line 3-cylinder fuel-injected engine with a downdraft intake. The engine has been tuned to provide plenty of low to mid-range torque with strong yet linear throttle response. STYLING You won't find a lot of plastic parts on the XSR900. The "authentic sports" styling highlights Yamaha's long racing heritage, but don't be fooled, there is plenty of cutting edge technology under the aluminum shrouded fuel tank. INSTRUMENTATION Multifunction, digital instrument displays all the info discerning sport riders demand. From a bar style tach to gear position indicator, to instant & average fuel economy, this classic round design liquid crystal instrument adds function and style. Features may include: ENGINE Compact, 847cc, DOHC, 12-valve (4/cyl), liquid-cooled, 42.5 degree inclined, inline-three cylinder engine. 4-valve, downdraft style combustion chamber Valve adjustment intervals are every 42,000 kms. 120 degree CP3... cross plane concept crankshaft. Lightweight "coupling force balancer". "Fracture split" connecting rods feature a "nut-less" design. Lightweight, forged, aluminum short skirt pistons. Direct ceramic composite plated cylinder uses "liner less" bores. Offset cylinder design. One-piece cylinder & upper crankcase assembly. CHASSIS CF (Controlled Filling) die cast, twin spar, diamond-type, aluminum frame Riding position is one of the most important features of the XSR900 chassis. Detachable, round tube steel rear sub frame. Externally mounted, C.F. (Controlled Filling) die cast aluminum, truss-type rear swingarm. Adjustable, 41 mm inverted cartridge style fork offers 137 mm (5.4") of wheel travel. Lightweight, aluminum upper & lower triple clamps. Adjustable link-type Monocross rear suspension with 130 mm (5.1") of wheel travel. ABS equipped, dual 298 mm floating front discs squeezed by radial mount, mono-block, 4-piston calipers. 5-position adjustable front brake lever ABS equipped, 245 mm rear disc is squeezed by a lightweight single piston, slide-type Nissin caliper.